The boat has been dewinterised. The Topaz Truck came last Friday and filled up the fuel tank. So the boat can again do what it’s designed to do, cruise on the water. I have asked Bill Kee, Michael Eustace and Neil Mc Laughlin to help me bring the boat from Dover to Calais as Nuala will still be working. So I suggested to Bill and Michael (Neil lives in England) that they come down to the boat for the refuelling day and help me move the boat to a berth where the tanker could reach it.Once the diesel was on board, we could then go for a fast practice run down the Shannon so they could get used to handling the boat and decide if they would come to Calais with me. Once again my former colleagues at Topaz Local Fuels have done me proud. 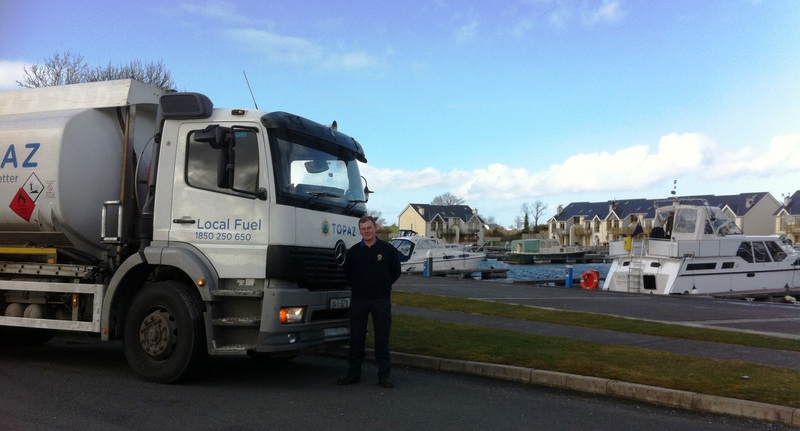 Colm, the driver arrived on time and carefully pumped the diesel into the boat tank. (Not a job normally done directly by an oil tanker). Bill & Michael showing what the boat can do ! Michael inspected the life raft, flares and radio. (Does he not trust me or what?) I hope Penny, his wife, is reading this and sees the elaborate precautions we are taking as she was worried about us all crossing the English Channel. Bill fixed the horn and replaced some navigation light bulbs. Afterwards both Bill and Michael helped me put on the new names on the bow. 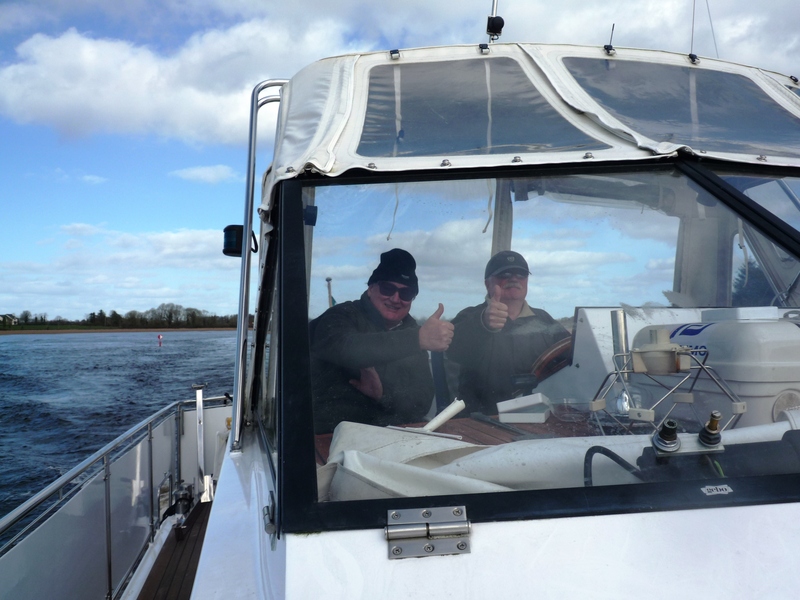 When the boat was fuelled and ready, it was lunch time so we went to Keenan’s Pub for a great lunch before putting the boat through its paces. Bill & Michael ready to take on the challenge ! 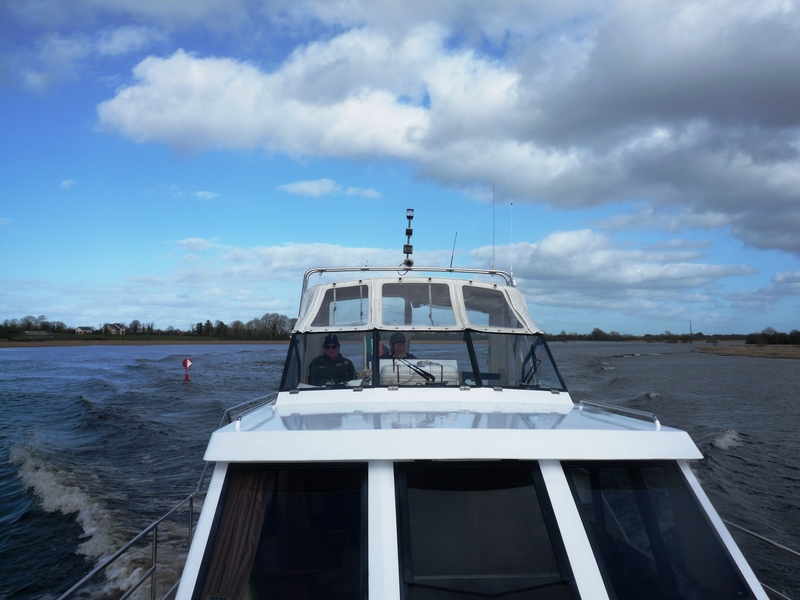 On the run down the Shannon I lifted all the floor boards and made sure the engine was running well, that there were no leaks and all systems were working. The boat behaved perfectly and Bill and Michael declared themselves happy to cross the Channel in it. So that is another major project checked off the long list. The boat is ready, straining on its ropes and all set for the adventures ahead. This entry was posted in C'est La Vie - The Boat, Getting Ready for Gap Year, People We have Meet on the Gap Year, Uncategorized and tagged getting the boat ready, Tarmonbarry. Bookmark the permalink.